Female specimens with eggs visible as a greenish mass within the body. Specimen from Johor state, southern Peninsular Malaysia. Originally known only from Johor and Pahang states, Peninsular Malaysia but since recorded from the Batang Hari river drainage, Sumatra and the Kapuas system, Kalimantan Barat (West Kalimantan) province, Indonesian Borneo. Type locality is ‘Tahan River, Pahang, Malaysia’. Most commonly found in shallow, slow-moving sections of forest streams or other calm habitats such as swamps, oxbows, and backwaters. Many such environments are associated with ancient peat swamps and contain black water. Such habitats are typically shaded from the sun by marginal vegetation and the tree canopy above. The water has a negligible dissolved mineral content, is poorly-buffered and pH can be as low as 3.0 or 4.0 due to release of tannins and organic acids from decaying organic material. Depending on locality the substrate may be composed of peat, mud or sand with the fish typically abundant in piles of leaf litter. P. malayana is found living syntopically with P. semicincta across much of its range and in the Endau river drainage, southeastern Peninsular Malaysia sympatric fishes include Brevibora dorsiocellata, Rasbora cephalotaenia, R. einthovenii, R. dusonensis, R. paucisqualis, ‘Puntius‘ johorensis, ‘P.‘ partipentazona, Trigonopoma gracile, T. pauciperforatum, Betta pugnax, Sphaerichthys osphromenoides, Acanthopsoides molobrion, Vaillantella maassi, Pangio cuneovirgata, P. doriae, P. filinaris, P. piperata and P. shelfordii. An aquarium with base measurements of at least 45 ∗ 30 cm or equivalent is recommended. Use a soft, sandy substrate since this species likes to dig and tends to spend some of its time completely buried. When coarser gravel is used it may become stressed or damage itself, and feeding behaviour can be inhibited. A few driftwood roots and branches, placed in such a way that plenty of shady spots are formed, can be used to add structure to the display and addition of dried leaf litter would provide additional cover and aid in simulating natural conditions. Fairly dim lighting is also preferable and aquatic plants such as Microsorum, Taxiphyllum, and Cryptocoryne spp. can be added. Gentle filtration providing a little surface agitation is adequate and high flow rates best avoided. Ensure that small specimens are unable to enter filter intakes and cover the tank well as most loaches do jump at times, especially when introduced to a new environment. Chiefly a micropredator sifting mouthfuls of substrate through the mouth and gills from which insect larvae, small crustaceans and suchlike are extracted, with a proportion of the natural diet also likely to comprise organic detritus and plant material from the gut contents of prey. In the aquarium it will accept sinking dried foods but should also be offered regular meals of live and frozen Daphnia, Artemia, bloodworm, micro worm, grindal worm, etc. Pangio spp. are peaceful both with one another and other fishes and there exist no reports of them harming tankmates though they may prey on eggs or fry. In nature they’re often found in large aggregations and in captivity will often pack themselves into a single nook, cranny or cave when at rest, so a group of at least 5-6 specimens should be the minimum purchased. Small, peaceful species from similar environments such as Boraras, Sundadanio, smaller Rasbora, Trichopsis, Sphaerichthys, Kottelatlimia, etc., constitute the best tankmates. Some sand-dwelling loaches from the family Nemacheilidae are also suitable but proper research is essential as some can be excessively competitive, territorial or otherwise aggressive. Adult females are typically heavier-bodied and a little larger then males, while in mature males the first pectoral–fin ray is branched and thickened. This species is most often encountered as bycatch among shipments of similar-looking congeners. It’s included in the P. kuhlii–oblonga group of closely-related species within the genus and can be distinguished from other members by the following combination of characters: possession of long nasal barbels pierced at the base by anterior nostrils; 10-16 dark saddles restricted to the upper half of the body and slightly broader than the spaces between them except on the caudal peduncle where they’re usually narrower and longer; a black bar at the base of the caudal-fin; rest of caudal-fin hyaline; three dark bars on the head with the one passing through the eyes not meeting below the lower lip, emarginate caudal-fin; greyish lateral stripe. Within the group P. malayana looks most similar to P. cuneovirgata but can be told apart quite easily by lacking nasal barbels (vs. possessing) and possessing an emarginate caudal-fin (vs. truncate). Kottelat and Lim (1993) suggested that the P. kuhlii and P. oblonga groups represent two of four such assemblages within the genus alongside the P. anguillaris and P. shelfordii groups. P. malayana was included in the P. khulii group based on its barred colour pattern and lack of labial barbels. This unofficial system was followed until Bohlen et al. (2011) published a molecular phylogenetic analysis including 18 recognised species plus a number of undescribed ones. Their results suggest the existence of three, rather than four, major lineages within the genus; the P. anguillaris and P. shelfordii groups represent two of them with Kottelat and Lim’s P. kuhlii and P. oblonga groups together forming the third. Within this third lineage are three sublineages formed by P. filinaris, an apparently undescribed fish from the Temburong River in Brunei referred to as P. cf. oblonga IV, and all other species in the group, respectively. Species in the P. khulii and P. oblonga groups had previously been separated largely on the basis of colour pattern, i.e., barred vs. plain brown, but in the molecular analysis the barred species grouped within the brown. They also display a high degree of morphological affinity with simlarities in body shape and the number of vertebrae. One brown specimen even grouped together with the barred P. malayana collected from the same locality rather than any of the other plain fish, suggesting a degree of phenotypic variability within species may also be involved. Pangio is among the most speciose cobitid genera and widespread throughout South and Southeast Asia with species diversity thought to be considerably greater than currently recognised. Pangio species are often generically referred to as ‘kuhli’ or ‘coolie’ loaches in the aquarium hobby, the latter a variation of the former which was itself derived from the surname of German naturalist Heinrich Kuhl (1797-1821). Ichthyologists tend to refer to them as ‘eel loaches’. They’re distinguished from other cobitids by their long, slender body shape, relatively high number of vertebrae and the position of the dorsal-fin which is situated well behind the origin of the pelvic fins (vs. in front of, above or only slightly behind). Several described members were previously included in the genus Acanthophthalmus which Kottelat (1987) demonstrated to be a syonym of Cobitis, and he chose the replacement name Pangio in preference to its simultaneous synonym Apua (Blyth, 1860). Myers (1929) placed P. anguillaris as type species of Cobitophis, a grouping containing the very elongate species, while Perugia (1892) originally described P. doriae in the genus Eucirrhichthys. The former was synonymised with Acanthophthalmus by Nalbant (1963) and the latter by Roberts (1989). In the most recent study Pangio was found to be more closely affiliated with Acantopsis, Acanthopsoides and Kottelatlimia than Lepidocephalichthys as had been previously hypothesised. All cobitids possess sharp, motile, sub-ocular spines which are normally concealed within a pouch of skin but erected when an individual is stressed, e.g. if removed from the water. Care is therefore necessary as these can become entangled in aquarium nets and with larger species even break human skin. Notes on Malayan fresh-water fishes Nos. 6-8. Phylogeny of the Southeast Asian freshwater fish genus Pangio (Cypriniformes; Cobitidae). 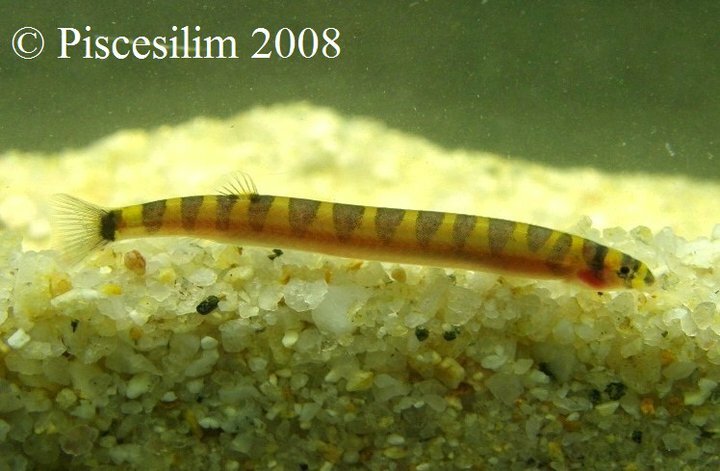 A review of the eel-loaches, genus Pangio, from Myanmar (Teleostei: Cypriniformes: Cobitidae). Pangio longimanus, a miniature species of eel-loach from central Laos (Teleostei: Cypriniformes: Cobitidae). Systematics of the Acanthophthalmus kuhlii complex (Teleostei: Cobitidae), with the description of a new species from Sarawak and Brunei. Pangio lidi, a new species of loach from eastern Borneo, Indonesia. A review of the eel-loaches of the genus Pangio (Teleostei: Cobitidae) from the Malay Peninsula, with descriptions of six new species.